As you may have already read in Fortune or in our press release, we have just released exciting new functionality for EVRYTHNG’s Smart Products Platform: THNGHUB, our Local Cloud Gateway! 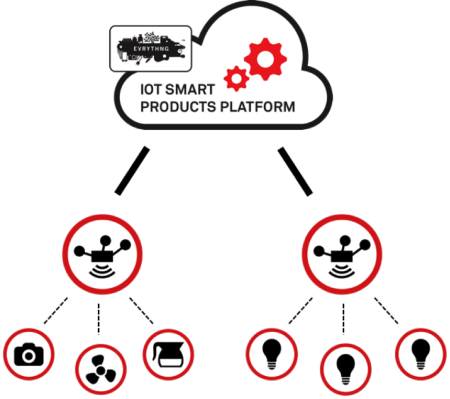 This is the first time that any hardware device, including products themselves, can be turned into hubs running a software gateway application that’s in lockstep with the full IoT cloud platform, allowing the same functionality both locally and remotely. Before digging into THNGHUB’s features, let me set the scene a little. Internet of Things (IoT) systems should be connected to well, the Internet! The Internet is the key difference between legacy home automation systems and IoT home automation; IoT systems (should) leverage the Internet and its proven networking protocols, like IP (v4 or v6), TCP, UDP, Ethernet, Wi-Fi, and 6loWPAN. In an ideal world, all IoT devices operating indoors would use Wi-Fi (or Ethernet if wired), and connect directly to home or enterprise routers. Wi-Fi simply isn’t an option for a number of IoT products. There are a number of reasons why; two of the most important are cost and power consumption. Firstly, the price point of Wi-Fi modules is still slightly higher than other low-power connectivity options. Secondly, current Wi-Fi protocols are not optimised for low-power consumption. Both of these issues are likely to be resolved as the mass production of Wi-Fi SoC (System on Chip) increases, and new Wi-Fi standards more suited to the IoT (for example, IEEE 802.11ah aka: HaLow) are being pushed out. In the meantime, the alternative is to use low-power protocols such as Zigbee, Bluetooth, Thread or Zwave. These protocols tend to consume significantly less power than the current Wi-Fi, and have better ranges thanks to their ability to operate in meshes, with each device acting as a relay for the others. Some of these protocols are becoming more important, and are now even supported by home and enterprise routers. But just as with the new Wi-Fi standards, these new routers will take years to be deployed “in the wild”. The alternative today is to use a gateway. A gateway is essentially a computer (comparable to a router or set-top box) that understands low-power protocols and bridges them to IP protocols. In short, it enable us to access a number of non-Internet devices, through the Internet. We saw that customers were re-implementing gateways over and over again for their smart connected products, so we decided the time was ripe for a customizeable gateway framework, and THNGHUB was born! To enable support for any protocol – including non-Internet protocols – THNGHUB has been architected around the notion of plugins. Plugins can support multiple protocols, including proprietary ones – from network protocols like Thread or Bluetooth mesh, or application protocols like Google Weave or Apple HomeKit. THNGHUB doesn’t just bridge devices to the Internet; it also transforms them to Web of Things devices, offering a local and cloud API to access and monitor them. Many IoT systems rely solely on a cloud to operate; a THNGHUB deployment offers the best of both worlds by enabling both local and remote access. This is especially important for devices requiring very low latency (like lighting systems) or mission-critical systems that need to operate offline (like a garage door or smart lock). From an application development point of view there is no difference in talking to the EVRYTHNG cloud or its THNGHUB local ‘cloudlet’: the APIs are the same Web APIs (REST, WebSockets) and the cloud and THNGHUB gateways are synchronized. This means you only need to build one set of Web apps, which can be used across platforms. 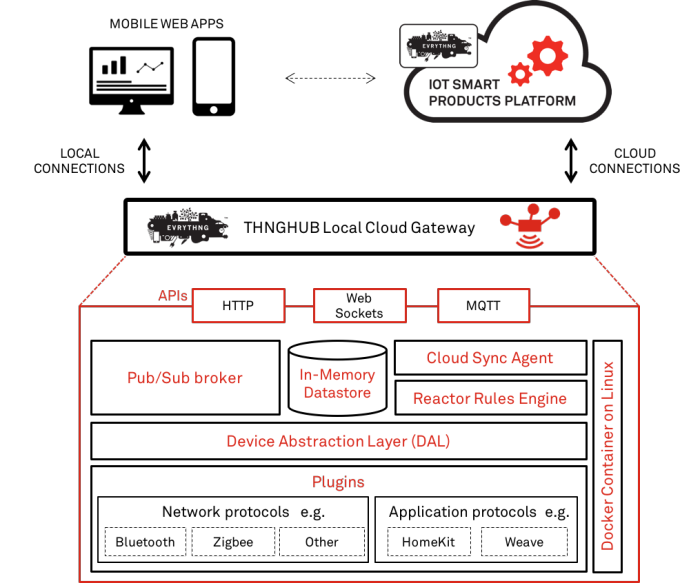 The Web of Things API isn’t the only part of the EVRYTHNG cloud platform that THNGHUB reproduces: it also offers the same powerful capabilities as our Reactor™ rules engine. This means that you can inject rules and scripts from the cloud to THNGHUB to do local filtering, local alerting, or to build local applications and mashups. THNGHUB’s features don’t stop there! It also offers local and cloud security (authentication + encryption), a local in-memory data store, a cloud synchronisation module, a local MQTT broker for machine to machine (M2M) communication, a distributed hub system for enterprise deployments, and much more! If you’d like more information about THNGHUB’s features, I recommend that you download the THNGHUB data sheet. THNGHUB can be used in many contexts, from the smart home to commercial or industrial IoT. Learn how our customer Gooee uses THNGHUB to make enterprise lighting a lot smarter, or download our detailed THNGHUB data sheet. Ready to talk to someone about your specific needs? Please get in touch!